A swift ascent in the organization has helped left-handed starting pitcher Cole Irvin show that he is one of the Phillies’ top pitching prospects. A 5th round pick in the 2016 draft, Irvin had undergone Tommy John surgery, missing the 2014 college season, and recovered enough to earn first team all conference honors as a red shirt junior, posting a 6-4 record with a 3.17 ERA and a 7.9 K/9 mark in 17 contests for Oregon. Irvin was the first of the Phils’ 2016 draft selections to reach the Double-A level and has enjoyed notable success at each level. 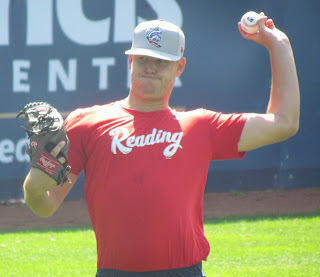 Irvin made his professional debut shortly after signing with the Phillies as a member of the Class A short-season Williamsport roster. In 10 outings there (seven starts) he sported a 5-1 record with a 1.97 ERA while striking out 37 and walking just eight in 45 2/3 innings of work. Last year, Irvin opened the season with Class A Advanced Clearwater. In 12 games (11 starts) he posted a 4-6 record with a 2.55 ERA while striking out 52 and walking 14 in 67 innings. He earned a promotion to Double-A Reading in June. In 13 starts he would notch a 5-3 record with a 4.06 ERA with 66 strike outs and 24 walks in 84 1/3 innings. The repertoire for Irvin includes four-seam and two-seam fastballs, a strong change up that he can throw in any count, a slider and a curve ball. Irvin has, at times, thrown a one-seam fastball, but he cites its unpredictability as a reason why he doesn’t go to it often. The fastball has movement with velocity that can often range 93-95 MPH. Irvin works quickly on the mound and has excellent command. He likes to take charge and dictate the pace of a game. While possessing a great understanding of the game and displaying mature instincts, he studies the opposition and will have a solid plan each time out. Listed at six-foot-four and 180-pounds, Irvin told me that weight’s not accurate. He’ll correct anyone who doesn’t put him in the 215-220 pound range. A native of the Anaheim, CA area, Irvin grew up as a big fan of Jim Edmonds of the Angels. He would also watch former Phillies lefty Cole Hamels and sees a reflection of Hamels’ mechanics and demeanor in his own approach. Irvin stays reserved with comparisons to the other Cole, but hopes to take the same path to the diamond at Citizens Bank Park. The talented 24-year-old will be a non-roster invitee to big league spring training this year and will get a chance to impress the Phils' coaching staff. He has the makeup and talent to be a big league pitcher and could prove to be a contributor at the top level for many year.